Well logging, borehole logging, hydrocarbon well logging or mud logging as it is often referred to is the process of creating a detailed record of the geology formations penetrated by a borehole. The log is usually based on visual inspection of samples brought to the surface, or on physical measurements made by instruments that are lowered into the hole. Well logging is performed during many phases of a well's history - either in the beginning when exploratory drilling is in process, during the production phase, or upon completion and abandonment of a well. Boreholes are drilled in search for oil, gas, groundwater, minerals and other geothermal or environmental studies. In order to detect oil and gas in particular, well cuttings are examined with a low power stereo microscope, often using darkfield or pseudo-darkfield. The darkfield helps in identifying oil staining and the lithology of the borehole rocks. The lithology is a description of the rocks' physical characteristics visible in samples. 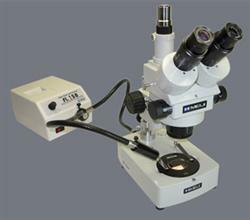 View mud and well logging microscopes here. The oil and gas industries record rock and fluid properties to find hydrocarbon zones in the geological formations found in a borehole. The entire process will consist of lowering a logging tool into an oil well (hole) to measure the rock and fluid properties. Logging is performed as the logging tools are pulled out of the hole and data is recorded. The drilling depth when well logging can range from 500 feet to 35,000+ feet.